Rowan Trangmar is the Graphic Designer and a Managing Designer/Entertainer. Rowan has a degree in Graphic design from Chelsea College and takes care of the graphic designs of any promotional material that goes out for Twisted Designs. He designed the layout of this website. 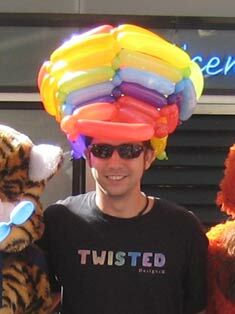 He is also one of the three main twisters here at Twisted Designs. Coming from Brixton, England, Rowan is now building a life for himself here in Brisbane. Brixton is one of the most culturaly rich places for Arts in the world and Rowan brings a bit of that culture with him offering it to you here in South East Queensland.